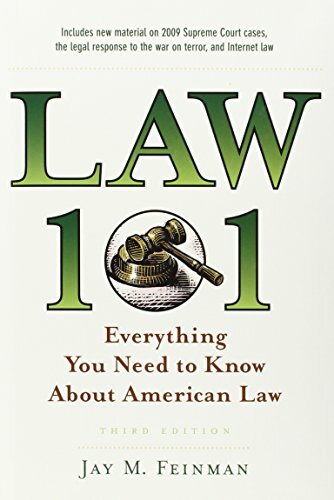 The first two editions of the best-selling Law 101 provided readers with a vividly written and indispensable portrait of our nation's legal system. Now, in this third edition, Jay M. Feinman offers a fully updated survey of American law that incorporates fresh material on 2009 Supreme Court cases, the legal response to the war on terror (including the Guantanamo detainees and electronic surveillance), and to the latest developments in Internet law. In a book brimming with legal puzzles, interesting anecdotes, and thought-provoking questions, Jay M. Feinman's clear introduction to the law provides us with a solid understanding of the American legal tradition and covers the main subjects taught in the first year of law school. Readers are introduced to every aspect of the legal system, from constitutional law and the litigation process to tort law, contract law, property law, and criminal law. Feinman illuminates each discussion with many intriguing, outrageous, and infamous cases, from the scalding coffee case that cost McDonald's half a million dollars, to the sensational murder trial in Victorian London that led to the legal definition of insanity, to the epochal decision in Marbury v. Madison that gave the Supreme Court the power to declare state and federal law unconstitutional. He broadens the reader's legal vocabulary, clarifying the meaning of everything from "due process" and "equal protection" in constitutional law to the distinction between "murder" and "manslaughter" in criminal law. Perhaps most important, we learn that though the law is voluminous and complex, it is accessible to all. Everyone who wants a better grasp of current legal issues--from students contemplating law school, to journalists covering the legislature or the courts, to fans of Court TV--will find here a wonderful source of information: a complete, clear, and colorful map of the American legal system.